There is striking symmetry centered around the death of Kurt Cobain. Bleach (June 15, 1989) and Nevermind (September 24, 1991) were released 831 days apart. From Nirvana's Unplugged in New York Performance (November 18, 1993) to Kurt Cobain's death (April 5, 1994) is 138 days. Nevermind was released on 9/24. From the release of Nevermind to Kurt Cobain's death is 924 days. The release date (September 24, 1991) of Nevermind has numerology identical to the gematria of the word "distortion". Nevermind and In Utero (September 21, 1993) were released 728 days apart. From the release of In Utero to Kurt Cobain's death is (7×28) days. The single "Pennyroyal Tea was scheduled to be released April 1994, the same month Kurt Cobain's body was discovered in his home at 171 Lake Washington Blvd. Cobain said in an interview, "The song is about a person who's beyond depressed; they're in their deathbed, pretty much." The lyrics reference Leonard Cohen. In Utero was released on Leonard Cohen's birthday. Nirvana recorded 3 studio LPs - Bleach (6/15/89), Nevermind (9/24/91) and In Utero (9/21/93). Bleach (June 15, 1989) was released 147 days before the fall (November 9, 1989) of the Berlin Wall. It's release date (June 15) can be written 15/6. The date (November 9) The Berlin Wall came down can be written 9/11. 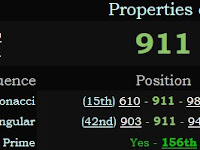 911 is the 156th prime number. Kurt Cobain would die 147 days after the fourth anniversary (November 9, 1993) of the fall of The Berlin Wall. 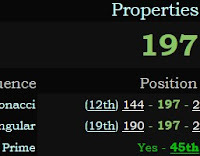 197 is the 45th prime number. 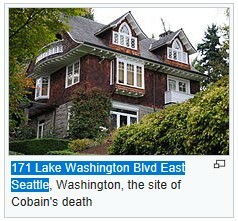 The date (April 5) of Cobain's death can be written 4/5. 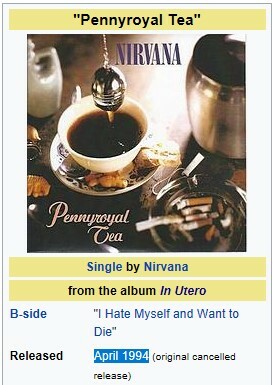 In Utero was released a 197 day span before Kurt Cobain's death. 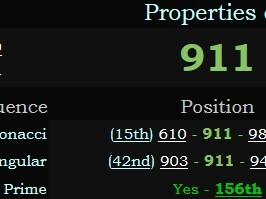 Bleach was released 831 days before Nevermind. Kurt Cobain would die 138 days after Nirvana's Unplugged In New York performance. Nevermind was released 9/24. Kurt Cobain died 924 days after the release of Nevermind. Nevermind and In Utero were released 728 days apart. Kurt Cobain died (7×28) days after the release of In Utero. Bleach was released 147 days before the fall of The Berlin Wall. Kurt Cobain would die 147 days after the 4th anniversary of the fall of The Berlin Wall.